(Bloomberg) -- On the new Norwegian Bliss, cruise passengers can drive go-karts on a two-story racetrack, listen to a Beatles cover band inside a replica of Liverpool’s Cavern Club or play laser tag in a space-themed, outdoor arena. Those are just three of the dozen or so entertainment options on the ship, which cost $1 billion to build and will ply Alaskan waters this summer and the Caribbean in the winter. Prices for a one-week Alaska trip in mid-July range from $2,800 per couple for an inside cabin to more than $11,000 for the company’s exclusive Haven suites. Carnival’s newest vessel, the 3,960-passenger Horizon, has a Dr. Seuss water park, a Havana-themed night club and an Imax theater. In March, Royal Caribbean christened the industry’s largest ship, the 5,518-guest Symphony of the Seas, featuring an outdoor aquatics arena with acrobats, a zip line and wave machine for onboard surfing. Norwegian, the oldest and smallest of the three big operators, ripped up the traditional model of cruise dining 18 years ago when it allowed guests to spontaneously choose which restaurant they wanted to eat at, with no assigned tables or dinner times, a concept it called freestyle cruising. Since then, the line has tweaked that model by adding “specialty” restaurants that charge a little extra for guests who want say a rib-eye steak ($20) and truffle oil mashed potatoes ($3) instead of the fare in the main dining room. It’s also begun offering well-heeled travelers a pricey-enclave within its ships called the Haven, with separate pools, spas and places to dine. Other cruise lines, though usually not the highest-end ones, have copied the Norwegian model of offering restaurant options with additional charges for meals. Now Norwegian, which like its main rivals is based in Miami, is asking guests to pay a bit more for entertainment. 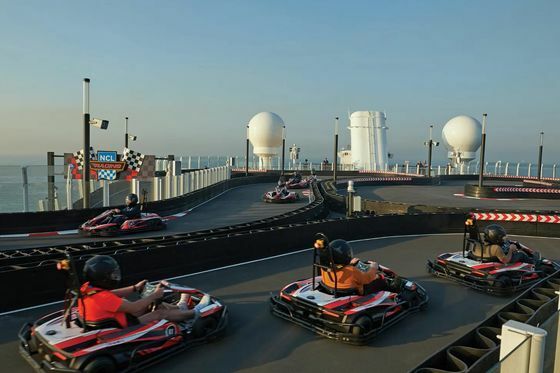 The go-karts on the Bliss cost $9.95 for 8 laps, while the laser tag is $5 for about 10 minutes of galactic warfare. The adults-only “Happy Hour Prohibition -- the Musical” costs $24, including gratuities. Many entertainment options on the Bliss are free, including two water slides, the Beatles show and a couple of big musical revues including “Jersey Boys,” an almost full-length version of the Broadway hit. Some nights the comedy club turns into a silent disco, where patrons wear headphones and can dance and sing along to different songs than the person next to them. The strategy is paying off. 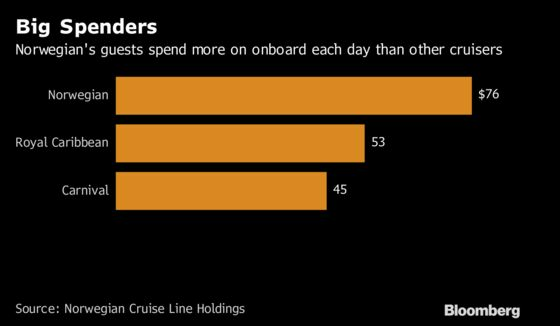 Norwegian said its onboard revenue is tops among the big cruise operators at $76 per day, compared with $53 at Royal Caribbean and $45 at Carnival. It also leads in terms of overall revenue from onboard extras, like drinks, gambling and shore excursions. So far, rivals aren’t charging for some of their gee-whiz attractions. Carnival’s SkyRide, a pedal-powered vehicle that circles above the deck of the Horizon, is still free, for example. But Norwegian said the Bliss, its largest vessel at 4,004 passengers, is the most successful new ship it has launched, in terms of advance bookings and prices. It’s all about giving customers options, according to Andy Stuart, chief executive of the Norwegian line.